Published on January 22, 2015 in Education, General T&T and Schools. 2 Comments Tags: Hillview College, Stephen Kangal. Statement delivered by Stephen Kangal, member of the Pioneering Class of 1955 at the Thanksgiving and Plaque Dedication Service held at Aramalaya Church on Saturday 17 January 2015 to Commemorate the 60th Anniversary of Hillview College. Good Evening and welcome to this Hillview Service of Thanksgiving and Plaque Dedication Function today. I am not going to give a detailed narrative history. I will attempt an analytical short history of the contribution of the Aramalaya Church made to the founding and progressive development of Hillview College. There is much to be said today within the limited 10 minutes allotted to me. Let us restrict ourselves to the change-changing role of Aramalaya in the founding of Naparima College, Tunapuna Branch 1955 as Hillview was then known. Firstly I extend to the Administrative Committee, The Principals past and present, the members of the Staff, the students, The PTA, The HOBA and indeed the Synod of the Presbyterian Church through our esteemed Moderator, who is with us today befitting the importance of this diamond occasion, warmest greetings and congratulations on the happy and ground-breaking occasion of the attainment of the Diamond Jubilee Celebrations of my alma Mater- Hillview College. I also send warm greetings and felicitations via the air-waves of Radio Heritage to our sister school, Iere High School on the occasion of their own 60th Anniversary and birthday today. Congratulations also to SAGHS who together with Hillview amassed 84 National Scholarships. Madame Moderator you must be pleased that your 5 Presbyterian Secondary Schools won over 30% of the National Scholarships including The President’s Medal. Congratulations to Iere for having given to us today our dear First Female Prime Minster of T&T in their graduate Mrs. Kamla Persad-Bissessar. Congratulations also to Pioneering Student of the 1955 Class and my colleague, Mr. Ralph Sampath who headed the Aramalaya Church for many years but whose health caused him to pass on the mantle to Elder Carlos Lakhan. Although Ralph is here today he is ill and we wish him better health God being his keeper.The wheel has come full circle. This Serice of Thanksgiving being held in Aramalaya today is rich in, faithful to the history of Hillview and powerful in its many symbolic messages. It is back to roots. Having achieved national grandeur Hillview is today demonstrating gratitude to God, The Presbyterian Church and the Aramalaya Congregation. There are six important symbolic messages to be read from the choice of the Aramalaya venue by The Principal for hosting of this Service of Thanksgiving and Plaque Dedication Ceremony. It is being held at Aramalaya on the actual birthdate of Hillview College that is to say the 17th of January. Secondly This is the venue and meeting place where the first lobbying by the Official Board of this Church for the establishment of a boys secondary school in North Trinidad was initiated in 1951 and consummated in 1955. 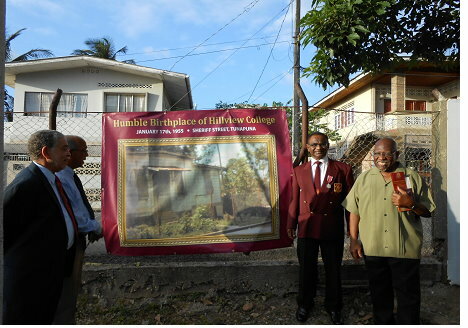 The fifth reason is that this is the last home of the Dr. John Morton the founder of the Presbyterian Church in Trinidad and Hillview pays homage to his memory for its own success. And lastly but no least this was de facto North Headquarters of the Presbyterian Church from where education and evangelization spread to churches in the East-West Corridor and Central Trinidad as powerful and luminous rays of light dispelling the darkness of persistent illiteracy and ignorance among the indentured laboring community of descendants.. From here also missions were mounted to Grenada, St. Vincent, Jamaica and Guyana. On Monday next, the Hillview Community will undertake a spiritual pilgrimage from its idyllic 1957 site located at El Dorado Road to the original 1955 site of Hillview on Sherrif Street. Those of us who studied at Hillview between 1955 and 1957 appeal to The Presbyterian Church to cannonise, consecrate, solemnise and elevate the actual original site to the religious status of a shrine- a sanctuary and a sanctum- a permanent reminder of our roots and genesis. For us that is Holy Ground to be preserved as a humble mecca for posterity and the source of great inspiration. We the pioneers will come again and again to the site to feel, relive and re-incarnate the spiritual ambience and benefit from Divine presence and Providence. It is these elements that drove and nourished the game-changing and career-determining Hillview legacy. Thanks to Aramalaya. I say this as one who claims very humbly to represent the institutional memory of Hillview having nurtured 60 years of continuous, unbroken linkage and connection with the Hillview College legacy and story. It was a jihad conducted against second class status. I started as a pioneering student in 1955, graduated in 1959, taught at Hillview from 1962 to 1978 and remained thereafter active on the Old Boys Association to date. Hillview is 60 years sewn into the very fabric of my life. It will remain embedded in my psyche forever. This Service of Thanksgiving symbolizes and recognizes Hillview’s very roots and deep and spiritual foundations sunk at Armalaya. It is getting our priorities right as we embark on a full year of celebrations for Hillview’s Diamond Jubilee. Hillview was actuated by a mission of achieving social and economic mobility outside of POS. It harnessed and exploited the rich veins of young human capital located in sub-urban-rural north Trinidad. The year 2014 is a vintage year for Hillview amassing an unprecedented 42 National Scholarships. This has created strong wind- a surge to drive our Diamonfd Jubilee sails. Today’s service symbolizes the real historical beginnings of the rise and rise of Hillview College. That history will be incomplete without the chapter that outlines the contribution of the Divine working through the Elders of the Aramalaya Church starting in 1951 and continuing uninterrupted. The Aramalaya Church acted as the persistent catalyst and activist for the commencement of Hillview College. It provided the facilities that housed the first class in 1955. It went on to accommodate the 1956 and 1957 classes as well on the ground floor of what is known as Morton House today. In 1955 we the pioneering students took over the cow-pen, the grounds and the orchards of the then Kirkpatricks Residence without any complaint from the occupants. That plot of land was the playground. Mrs. Kirkpatrick loved us all. Aramalaya also established the link between ICTA and Naparima College, Tunapuna Branch from where we drew several teachers from the wives of English students starting with Margaret Evans in 1957. Since then UWI and Hillview have developed a symbiotic connection and close relations. Aramalaya also provided the several chaplains that have served Hillview in religious education. Thank you Madame Moderator of the Presbyterian Church for your institutional and administrative support that made the difference in the innocent lives of thousands of graduates from Hillview. Let me also thank former Vice-Principal of Hillview College Mr. Robert Ramsahai for having in May 1998 written the only unpublished History of Hillview College while at UWI under the tutelage of Professor Brinsley Samaroo who is with us today. I also say thank you to the Aramalaya Congregation for your persistence in embarking on a boys education initiative as early as 1951 for the establishment of a boys secondary school. I thank Rev ET Lute of Naparima College for conceptualising a Five Year Development Programme for Presbyterian Secondary Education that was a game-changer. It changed the lives and career prospects of the many uncut and rough diamonds that lay embedded, unpolished, unsung and suppressed in rich veins in the earth of East Trinidad. By the mid-50’s SAGHs had been established at Austin Street in St. Augustine to cater for the educational of our sisters. Thanks to Miss Constance Wager and the Women’s Missionary Society (WMS). There was an obvious neglect of the boys. Beginning in 1951 Aramalaya took the struggle to all the courts of the Presbyterian Church in its unrelenting quest to have a- boys secondary school established in Tunapuna. God moves through you and me. The elders of the Aramalaya Church in 1951 were the instruments of His will. Thank you Aramalaya for the foresight and vision displayed by your elders who at that time included Messrs Clarence Darsan, Earle Kalloo, George Jitman, Haorld Sukhbir and C. M. Chatee and others. We also remember with gratitude the significant role that the late President Mr. Justice Noor M. Hassanali played in Hillview’s establishment. I recognize in the congregation today Dr. Clifford Ramcharan who as President of the Naparima Old Boys Association awarded to me the first scholarship to a Hillview graduate in 1960 to study A’Levels at Naparima College In San Fernando. He also served for 17 years as an Ad Com member at Hillview. Than you doctor. On that first day of 17 January 1955 I remember that Elder CM Chatee came and addressed the 44 students. His son Roderick is an Elder in this Church. After 60 years I can still smell the fresh varnish on the desks, the paint on the walls and feel the air of excitement and great expectations that filled the atmosphere of the new college that first auspicious day of 17th of January 1955. May Hillview aspire to and scale and surmount the higher peaks ahead. I am sure it was a nostalgic journey as past students came together to share stories about their days at Hillview but time moves us forward and congratulations to the Presbyterian church for its tremendous work in education. Thank You Mamoo for acknowledging the work of the Presbyterian Church in educational advancement and improving literacy in rural Trinidad while at the same time preparing the teachers and Principals for the Primary schools started by the SDMS in 1953 and later.